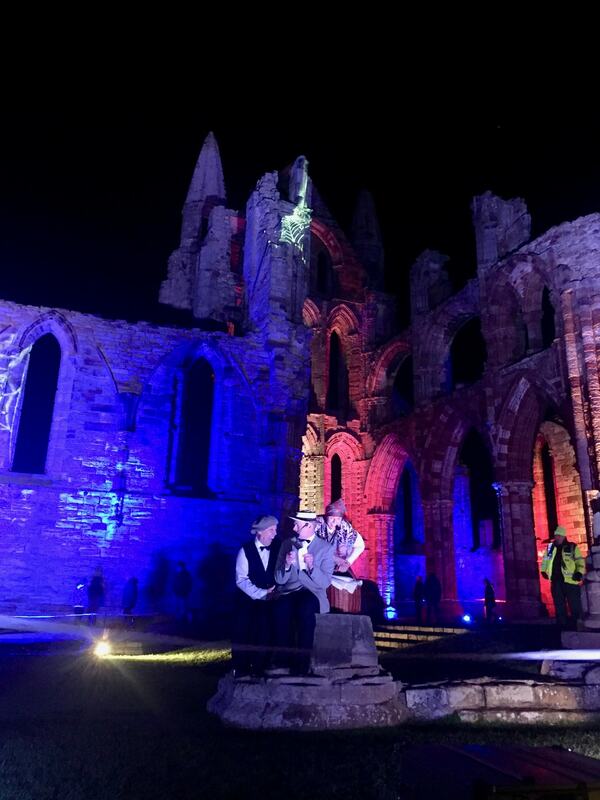 Is there a more apt and inspiring place than Whitby Abbey to hear the tales of Dracula? 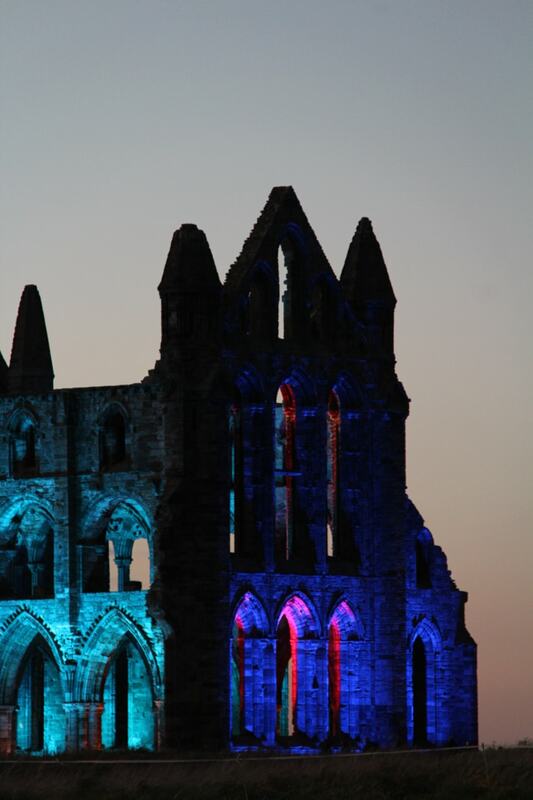 A Gothic Abbey set imposingly on a cliff above the bustling coastal harbour at Whitby…. 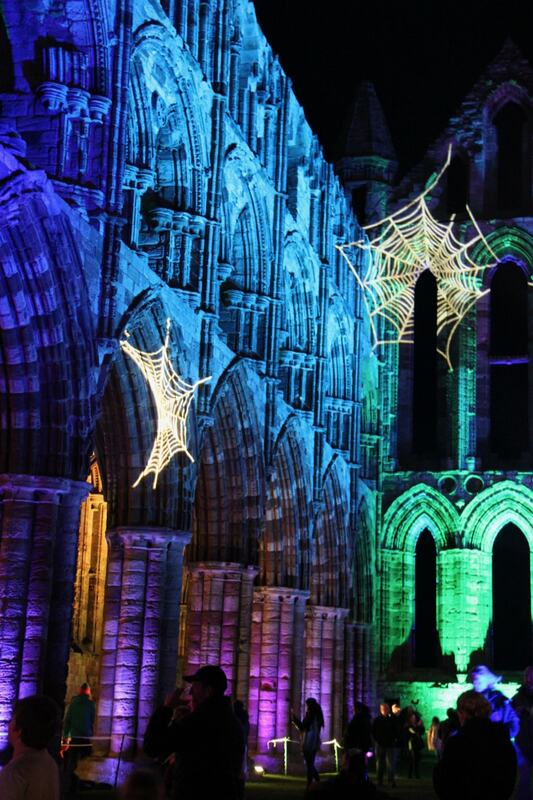 It’s ruins offering a spectacular backdrop for the night-time illumination show and performance of Bram Stoker’s Dracula. 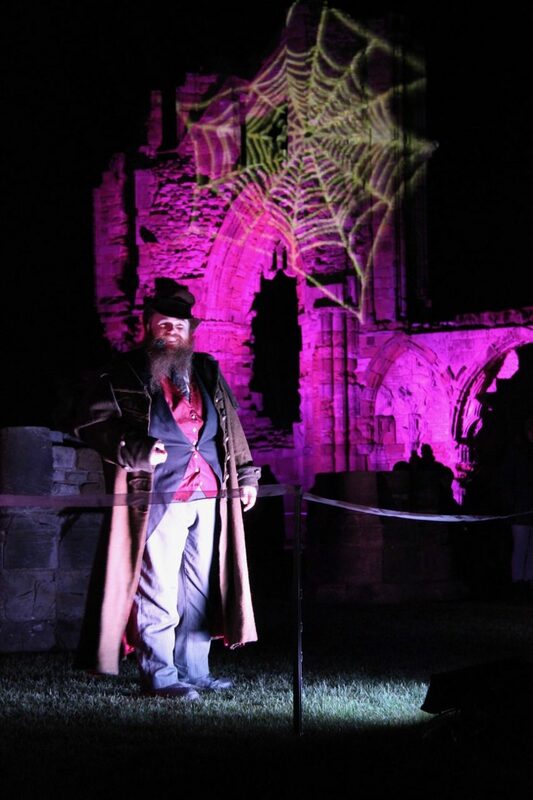 A truly memorable evening from one of the most iconic English Heritage sites. 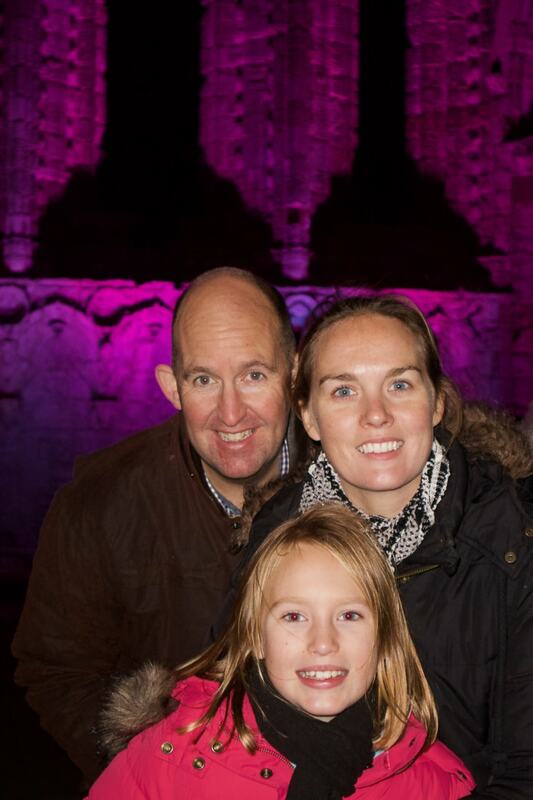 Having taken our girls across Europe in the search for new Roadschooling Experiences. We’ve uncovered some fantastic opportunities to learn. Most notably our visits to the French WW1 Battlefields to read Wilfred Owen poetry in the trenches. Or the chance to learn geology some 24km underground in the Postojna Caves in Slovenia….. however the chance to hear the story behind one of the Guardian’s Top 100 novels was always going to be a chance not to be missed…. 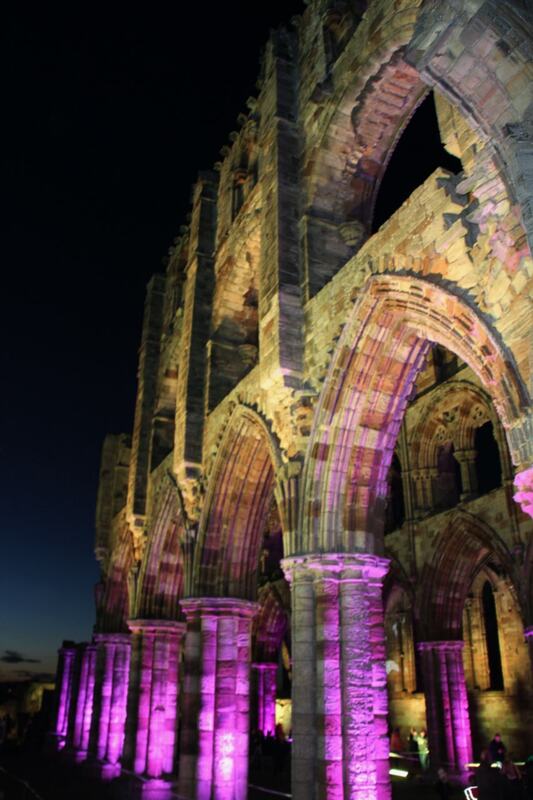 England is rightly known for its great stately houses, castles and churches but thanks to Henry VIII, a list of England’s Top 10 ruins could easily be dominated by ex-monasteries and having visited Whitby, we reckon its Benedictine Monastic ruins might also be worthy of celebration. 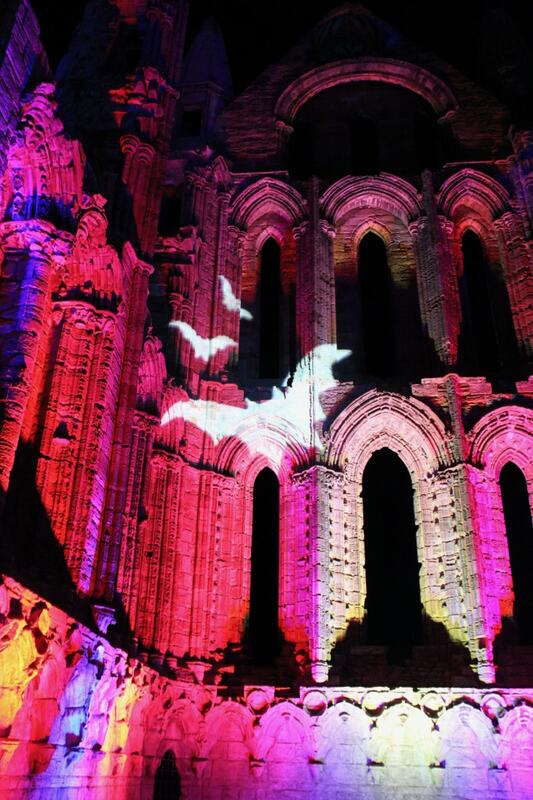 Especially if it can be put to such good use with this type of dramatic production of Dracula. But for those that choose to spend their time inside the ‘Leading Campings‘ resort style complex at Playa Montroig, you’ll not be disappointed by what you find… so we thought we’d try and distil it down into six reasons why we’d happily return here next summer. 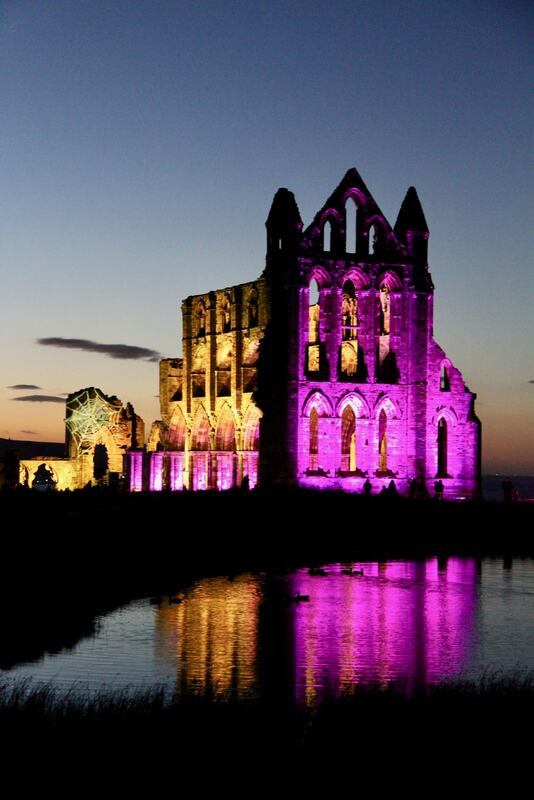 Arriving at the cliffside car park for the night-time illuminations, you’re met with an apparition of ghostly magnificence….. Doubled by it’s reflection off the monastic pond beside the Abbey. But when you add in the Halloween focus…. 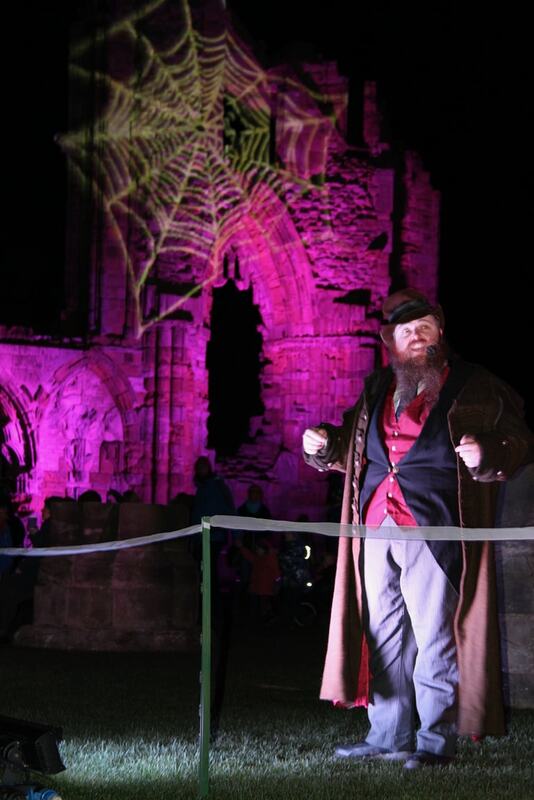 you come face to face with spider webs, silhouettes of bats and even the odd Victorian Undertaker strolling the ruins…. The remains of the abbey church that can be seen today date from the 13th century onwards. Full of sturdy columns and pillars….however its still very much a ruin, just like Corfe Castle.…. a place we visited on our trip from John O’Groats to Lands End… broken pillars stand casually on the grass with the earthworks defining the enclosure as much as the remaining walls do. It reminded our girls of the ‘Spectacles Nocturnes Son et Lumière’ you can find in the Chateaus of the Loire like Villandry or Azay le Rideau….. but whilst these were all set to music in lazy July summer evenings, this would be set in a cold October evening to the screams and cries of the actors performing an adaptation of Bram Stoker’s famous Dracula…. 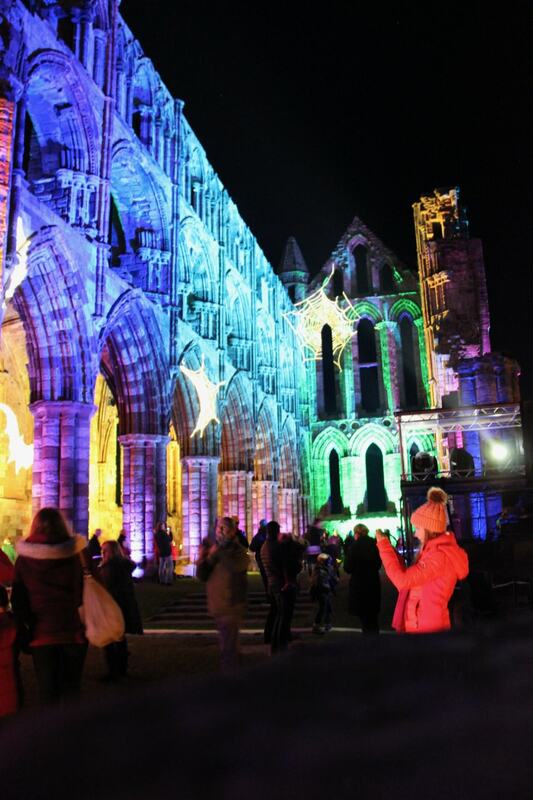 a tale imagined in Whitby itself! But before hesitant parents reading this might start reconsidering whether it’s suitable for their young children…. you’ll be delighted to know that the performance is aimed at families and has as many laughs as it has screams! It’s well written and performed, catching just the right note between re-telling the ‘real story’ of Dracula and making it accessible to kids with vivid imaginations!!! It just feels so apt, a performance only a few hundred yards from Whitby’s West Cliff where you can look out across the harbour town. 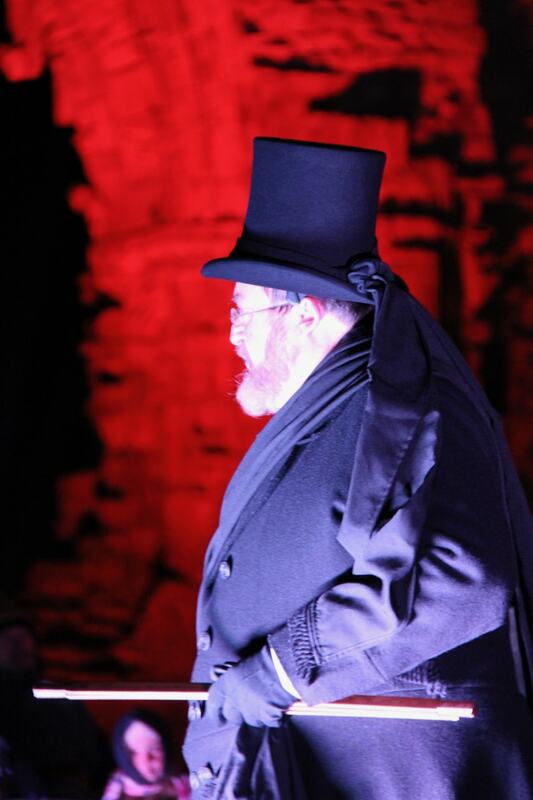 A venue dripping with history associated with Bram Stoker’s Dracula. From the half-ruined abbey to the nearby St Mary’s Churchyard, where Lucy was attacked by Dracula. To the sandbanks below (Tate Hill Sands) where the ship carrying Dracula ran aground. Or the 199 steps which rise up the East Cliff, the very steps that allowed Dracula, as a black hound, to flee after arriving in Whitby. 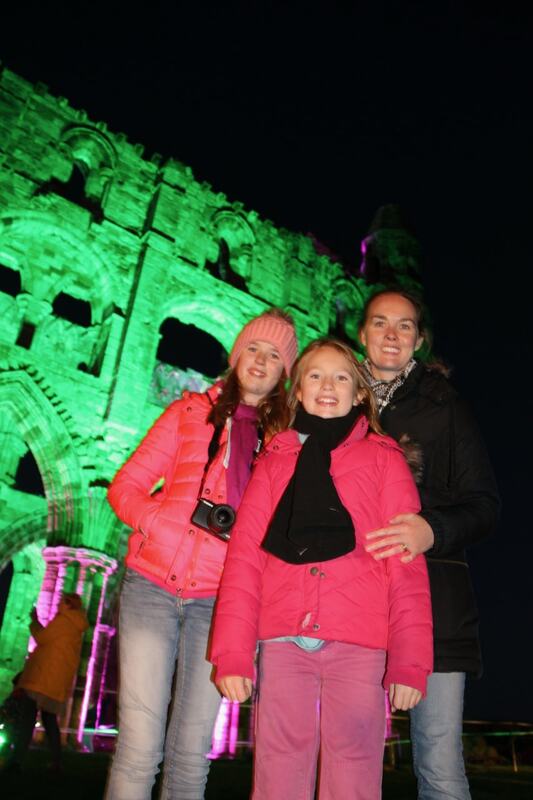 In truth, the girls loved every aspect of it….. from the atmospheric ruins to the chance to watch a live performance (just like the Tivoli Gardens in Copenhagen) It’s exactly this type of experience that we’ve been searching for across Europe…. an opportunity to inspire, engage and most importantly teach them about history and just how enjoyable creative writing can be…. I like alll the points youu have made.